There’s no denying that Derek Landri was a great surprise find for the Eagles last season. While he looked good in training camp, the team couldn’t find a roster spot for him, but after Antonio Dixon was lost for the year, they got a pass rushing boost picking up Landri after week four. I imagine the Eagles are offering him a cheap deal and also aren’t guaranteeing any playing time. [Mike Patterson, Cullen Jenkins, and Dixon] are locks to play. The rookie and Ced Thornton should be battling for snaps. And there sits Derek Landri on the outside. I think Tommy’s observation is astute, and it gives us a window into the Eagles plans regarding the defensive tackle position. Barring injury, Jenkins and Patterson will be the starters, and Dixon’s back-up spot is secure since he signed his second round tender. 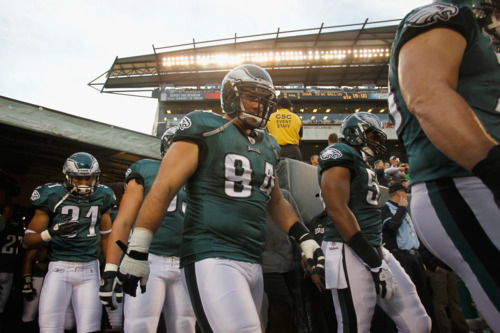 The Eagles only kept four defensive tackles last season, and they are likely to do the same in 2012. Knowing that, Landri should be happy to sign on as the fourth guy, right? And the Eagles should be happy to have him, right? Well, unless the Eagles are thinking about drafting another defensive tackle early in the draft. I’m sure Howie Roseman would like to have Landri back, but he won’t be handing out any kind of guarantee if Landri has no chance (outside of injuries) to make the roster. On the flipside, Landri won’t be eager to re-sign if he knows what’s going on. At the end of the day, Landri may decide he doesn’t have any better options than to fight an uphill battle in Philly. But the length of time he’s taken to make his decision suggests that neither side is eager to have him back. And that, in turn, points to the imminent arrival of another, more important defensive tackle prospect. Tagged with Philadelphia Eagles, NFL, Defensive Tackle, NFL Draft, Derek Landri, Antonio Dixon, Cullen Jenkins, Mike Patterson, Free Agency, Pass Rush, Tommy Lawlor. March 28, 2012 by Brian Solomon.